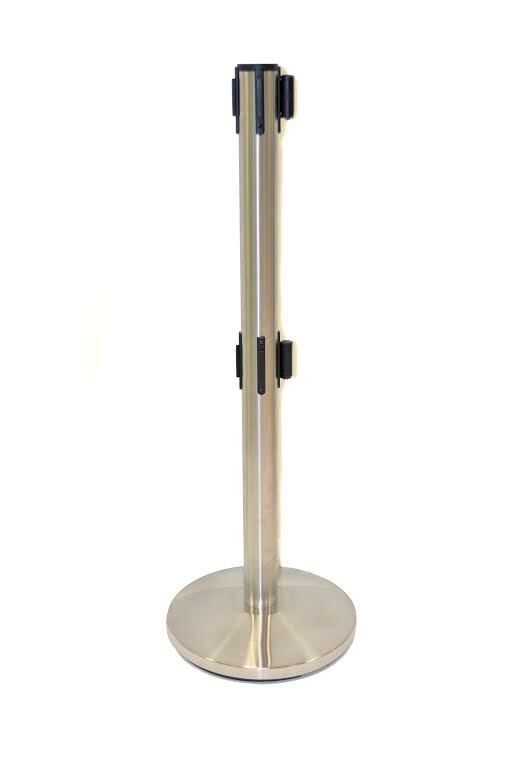 We have a variety of ADA Compliant stanchions to choose from. 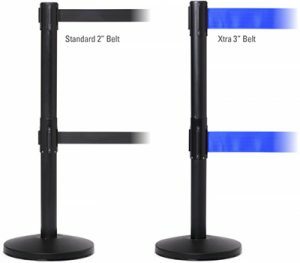 Our dual line retractable stanchions are ADA compliant and ideal for use in your lobby, restaurant or in construction areas, work zones or anywhere caution implementation is needed. The Queue Master Twin from Queue Solutions is an affordable solution to meet ADA Compliance requirements. 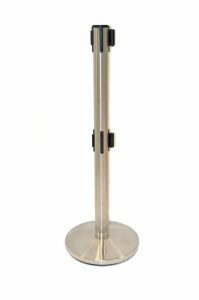 These retractable ADA Compliant stanchions are ideal for retailers, airports, restaurants, stadiums, hotels, casinos and other institutions. The Queue Pro 250 Twin from Queue Solutions is a high quality stanchion designed to meet ADA Compliance requirements. ADA Compliant stanchions Made in The USA. USE: See pricing area for indoor use or outdoor use models. WARRANTY: Retracta-Belt Model 300D/301D ADA stanchions have a 10 year limited manufacturer’s warranty against defective material or workmanship. This limited warranty excludes damage due to accident, misuse, abuse or negligence. Boulevard Supply is also a Tensator dealer. 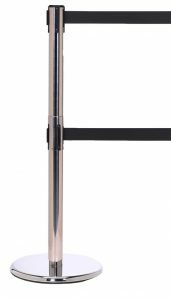 We have full access to Tensabarrier retractable stanchions. We highly recommend you make a map of your floor plan. Use dots for stanchion posts, uses lines for the belts. Remember to leave gaps for entrances and exits. It is also recommended to leave a minimum of 36″ between the bases in the aisles for wheel chair access. Also, if your stanchions come with a 10′ retractable belt, we recommend you only extend the belt 9′ to 9.5′ so you have some slack left in the belt cassette. QUANTITY: How many ADA Compliant stanchions will you need? POST AND BASE COLOR CHOICE: Choose from Black, polished stainless steel, satin stainless steel, or specialty powder coated colors. BELT LENGTH & BELT COLOR CHOICE: Most manufacturers offer two to three belt lengths with their stanchions. Ordering a longer belt offers you more flexibility and may require less stanchions for your project. Longer belts cost a bit more but may save you money in the long run. 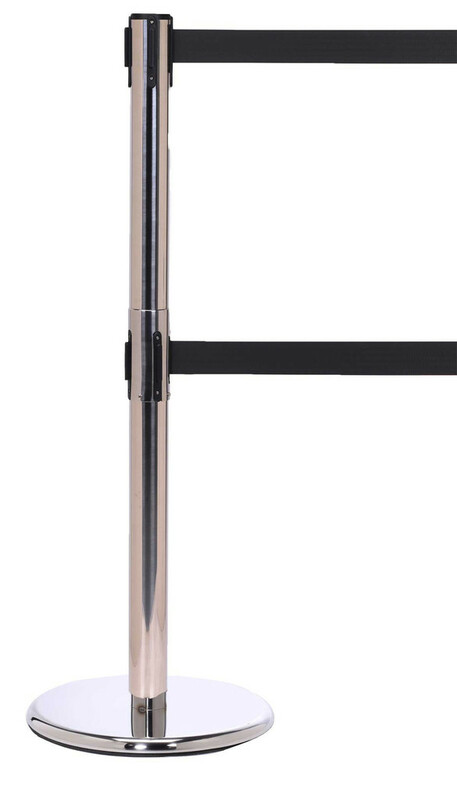 STANCHION USE: Will your ADA stanchions be used indoors, outdoor full time or outdoors on occasion? Depending on location and the amount of time your line barriers will be used outdoors, they may require weatherizing or weather proofing. DESTINATION: Do you have a fork lift or loading dock available? Will you need lift gate service? Any special delivery instructions?